Ride custom made street go-karts and dress up in your favorite Comic, Games or Animal characters. 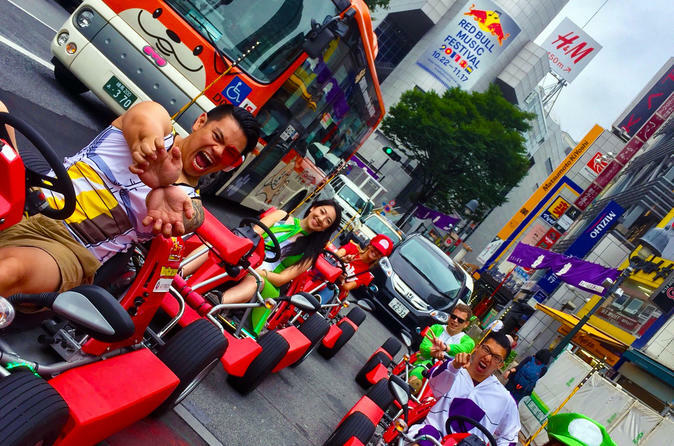 You can actually ride the karts on the streets of Tokyo. Experience a fun and safe ride with a professional guide. Choose a 2-hour or a 3-hour course for this fun adventure. Once you arrive at the meeting point, please check in, stating your name and reservation time and present your international driver’s permit and passport. Once the validity of the international driver´s permit is confirmed, you will be handed the "terms and conditions" and waiver to sign. Upon signature, please hand the waiver to a staff and choose your favorite costume. All customers wear the costumes over their clothing so there is no changing room but there are lockers for your personal belongings. Once all the participants are ready, you will be briefed on how to operate the karts and lecture you on safety precautions. After the lecture, you will hop in a kart and turn on the engine. Once all engines are running, then the Guide will lead the group on to the tour. As long as you know how to drive a regular car, handling a kart is not difficult. Just make sure to keep up with the guide to see Tokyo. You will not only see but drive on the Rainbow Bridge, drive through Odaiba, drive by the Tokyo Tower, drive through Toranomon Tunnel, Ginza, Asakusa, Ryogoku, Tokyo Dome, drive around the Imperial Palace and the Sky Tree. Choose a 2-hour or a 3-hour course for this fun adventure.